IN THE early 1900s The Journal of the American Medical Association (JAMA) had the largest circulation of any medical periodical in the world. 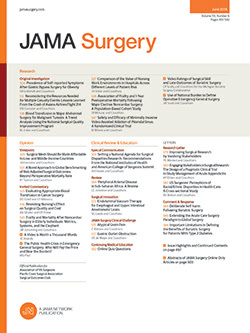 For some time the editors had planned to establish a surgical journal because it was not possible to publish all the contributions submitted to the surgical section of JAMA. Furthermore, many surgical articles were highly technical in nature and of little interest to the general readership. Thus, in 1920 the Archives of Surgery began publication, directed by a prestigious editorial board composed of Dean Lewis of Chicago, Ill, Hugh Cabot of Ann Arbor, Mich, Thomas Cullen of Baltimore, Md, William Darrach of New York, NY, Evarts A. Graham of St Louis, Mo, and William J. Mayo of Rochester, Minn.